I have always enjoyed blog hopping because I get to meet lots of real, ordinary people living ordinary lives who blog about their random thoughts and interests in life. Some sites I just drop and go. Some leave me feeling inspired or happy or touched so that I linger for a while, leave my two cents and shamelessly request for a link exchange. LOL! One of those blogs that I love to visit is Bambie's My Thoughts, My Heart, My Turf. As the blog title implies, this personal blog is all about Bambie's life: things that interest her, her thoughts on various events, her family, her little adventures in life and other stuff that she fondly calls "whatchamacallits". I find Bambie to be a very sweet person (especially to her nephew), who knows what and when to withhold and to share. She allows her readers to take a peek into her life but she also values her privacy. She is also one of my Couchers and I always look forward to reading her movies. She also is working from home and you can find lots of money making opportunities and helpful tips featured in her blog too. I love Bambie's no nonsense style of writing. Her frankness and honesty are reflected in her blog entries too. One will know upfront that this blog is owned by a woman. The pink dotted paper for the background is very appealing. The lavender text color against the pale blue text background is surprisingly very easy to read too! The three column template features various forms of advertising. There are also many affiliate programs to be found on both sidebars so that if you want to earn money from your blog, you are welcome to check them out. 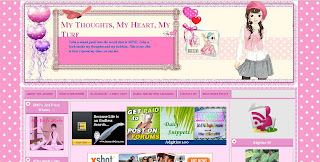 And oh, Bambie is cooking up her very first ever Blogversary Contest and will launch it on March 15th. She is still open for sponsorships so that if you are looking to gain more link love, traffic and free advertising of your blog, then check it out! Remember the blog title: My Thoughts, My Heart, My Turf.